If you've been reading this blog for - well, a few days - you'll probably have realised: I'm a big A Madness of Angels fan. It's on more than a few of my recommendations, I wrote an article on its magic system over at Grasping for the Wind, and of course I've reviewed it as well. Well - what about its sequels? With The Minority Council out in March, I think it's high time I caught up on the series. 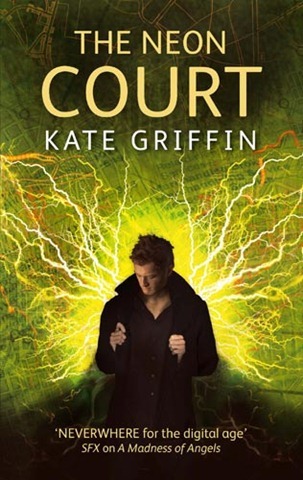 The third novel in the Urban Magic sequence, The Neon Court both conforms to - and then subverts - our expectations. For those who aren't familiar with the series, it's set in a Neverwhere-esque London, where tradition, custom and belief become magic. So, the blue electric angels - born from the emotion and life poured into the telephony system. And our hero, Matthew Swift, is partly them. (It's an awkward case of possession: let's just say his blood burns blue and he speaks in plurals, and leave it as that). At any rate, Swift is now Midnight Mayor - the mystical protector of London, a job which he thinks himself spectacularly unsuited for. Even the Aldermen, his supposed servitors in his duty, don't trust him. The threat in this one can't quite face up to that of The Midnight Mayor - pretty much everything looks friendly compared to the death of cities. Still, I'm glad that this is the novel which changes the pattern. For one, Swift isn't so fundamentally isolated: he's got a fellow sorcerer, his apprentice, along for the ride. (Penny's a great character in herself, but this is the key point for her inclusion) For another, I can say there are more changes: many of them. The Neon Court doesn't quite 'do a Martin', but it does come near. You can, nevertheless, still see a familiar pattern. Swift stumbles round into things and runs away, occasionally shoeless. And of course, there's the typically impressive 'I am' speech - and now Matthew has quite a bit to put after it. (His resume has to cover at least half of London's supernatural community and various states of mortality). I'm of mixed minds about this - on one hand, the formula works. It's a lot of fun, and it keeps Matthew from becoming such an overpowerful protagonist that the whole series has to escalate. On the other hand? It is a formula. So while The Neon Court deviates from its predecessors in some ways, in others, it's simply more of the same.